oh yes, i'm still going! trying to get as much of it done as i can while i still have that 'just started' momentum. although, to be honest, i picked really easy areas this time around. i mentioned my wardrobe declutter, but i didn't count the rest of the closet contents in that post. it's a fairly large closet, so it also holds my linens. there's not too much left to get done in terms of general areas, which is exciting. however, it is the stuff that's the hardest, which is why i put it off. i need to tackle the kitchen, the hutch in the dining room (which is pretty much an extension of kitchenware), and the contents of the bookcase in my room. oh and the two big boxes still in my parent's attic, which will hopefully get done when i pet sit in february. getting there, kids, getting there. Wow, you are making some progress!! I'm so inspired by these posts! LOVE that you are so dedicated! I'm working on our laundry today (the worst room in our house)....will let you know how we go! That's awesome how you're decluttering so much! I've been trying to declutter my room but the moment I see something from 5 years ago, I just think... "I need to keep this! That was such a fun day with my friends" and then I just throw it back into this bucket of random useless assorted things I keep. You are so productive and on top of things. After reading your posts I always feel like I need to go do something with my life. I like that the ceramic holder thing broke. That always helps! Haha I'm still avoiding my kitchen, so I hear you! Good luck on the bathroom! Every time I read your updates I am torn between being proud of you and feeling like a hoarder. 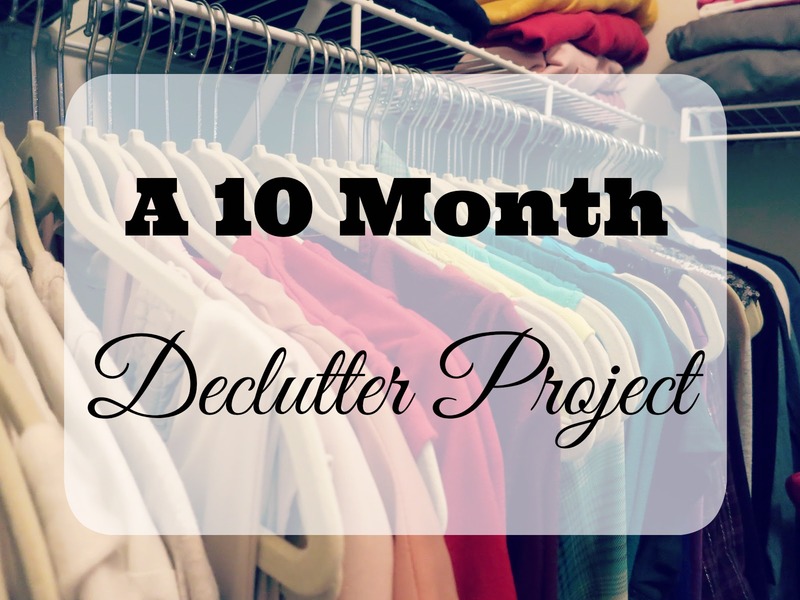 today, today i am working on decluttering! I love that you are going room by room... this is inspiring me to do my own decluttering around the apartment. I've notice that when space is limited, it tends to really pile up quickly (or maybe that's just because there are less places to hide junk??) :) Thanks for this! And I am totally with Jess above---my buckets of useless assorted things have become laundry basket sized. I told Jess - I take pictures of sentimental stuff. That way, I don't feel bad parting with the useless item. You are a pro. You got rid of a DVD and digital camera? So impressed. Nice! I'm doing the same thing because I'm moving in April but the worst places are storage and the garage. Those will require lots of wine!! You did such a great job and seriously made me feel to start decluttering immediately now that exams are over for me and work is a little less hectic. Good luck with the kitchen and other stuff! you are doing so fabulously and i am loving following along. the kitchen is really hard for me for some reason.